Temperatures across Oklahoma dipped into the teens and 20’s March 25 and 26 (see maps below). The rule of thumb is temperatures below 24F will damage wheat at or past the jointing stage, so it was certainly cold enough to injure wheat that was not delayed due to drought stress, grazing, or late emergence. Freeze injury is not an exact science, and it remains to be seen whether or not we actually have widespread wheat freeze injury in the 2013 wheat crop. My best guess is that we will have some injury and might lose our primary tillers in more advanced fields. Wheat that is at Feekes growth stage 6 – 7 generally has the ability to compensate for primary tiller loss by keeping secondary tillers that would otherwise be sloughed off in April. In this scenario, the effect on final grain yield would be minimal. 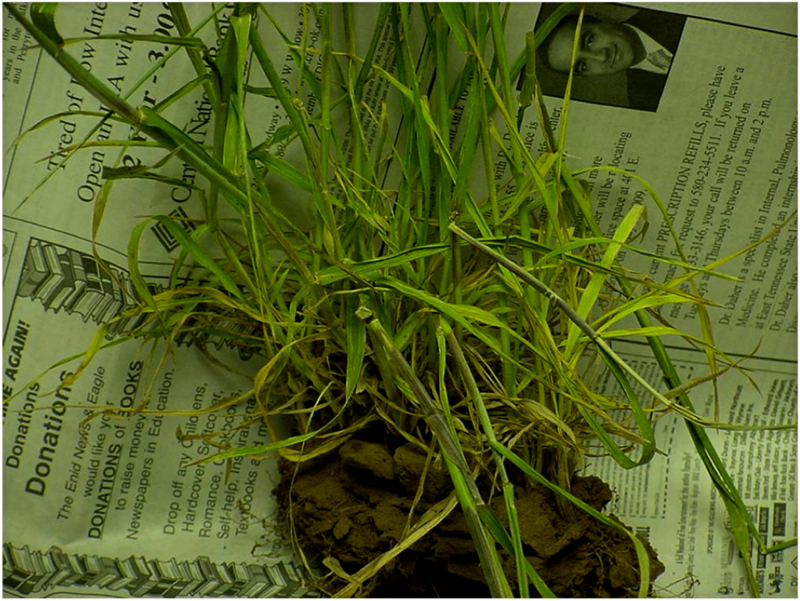 Wheat that has already aborted secondary tillers does not have this flex ability and will not recover from freeze injury. This is why March freezes are generally yield reducing and April freezes are yield eliminating. I will check fields late next week and post the results on this blog. 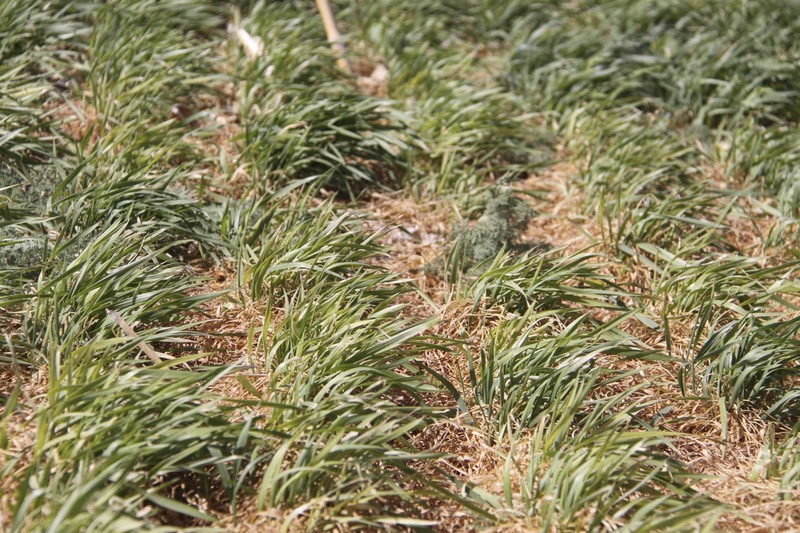 Freeze injury is not clearly identifiable until 7 – 10 days after the freeze event. So, the best advice for a wheat farmer after a freeze event is to find something else to do for a week or two and then check your crop. I have provided some pictures below with typical injury symptoms and rules of thumb regarding the extent of the injury. 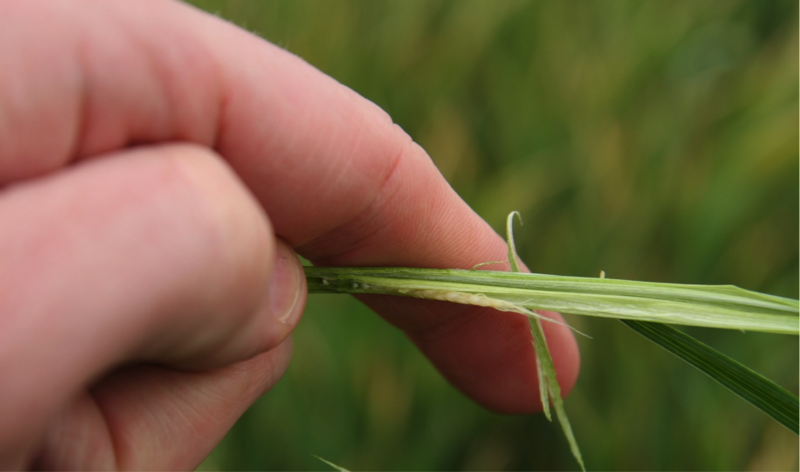 Fields should be checked at several random locations by splitting 10 – 20 stems at each location and looking for injury. Don’t focus solely on the large stems. Split a random sampling and determine the percent damage. 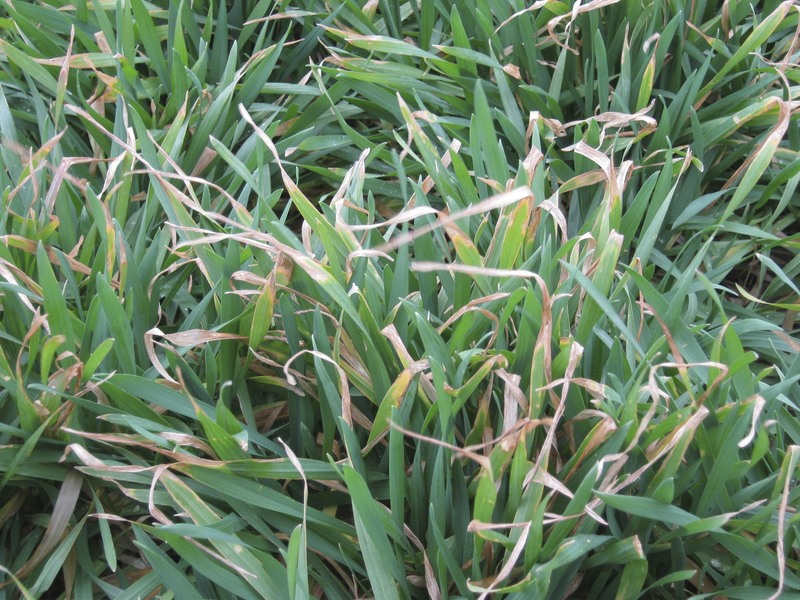 A good reference for evaluating freeze injury to wheat is K-State Extension Publication C-646 Spring Freeze Injury to Kansas Wheat (access online by clicking here). This is a healthy wheat head at approximately growth stage 6 – 7. Note the light green color and healthy, turgid appearance. Freeze injury just after jointing. Note the pale, milky color of the head. Freeze injury to wheat heads at this growth stage is all or none, so this head is a complete loss. 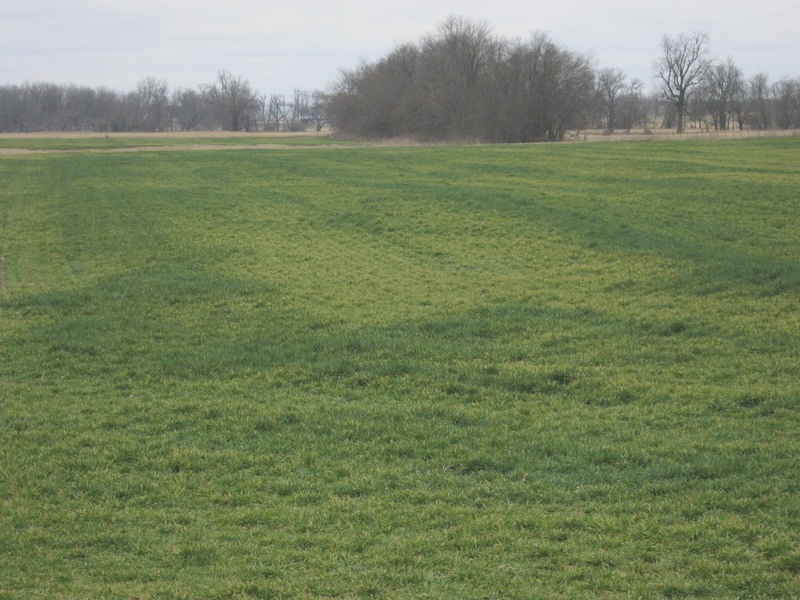 Yellowing is a common reaction to light freeze injury. Wheat will recover quickly from this injury. It is common for sub-lethal freeze injury to result in bent or weak lower nodes. These plants might look fine, but will lodge during grain fill. 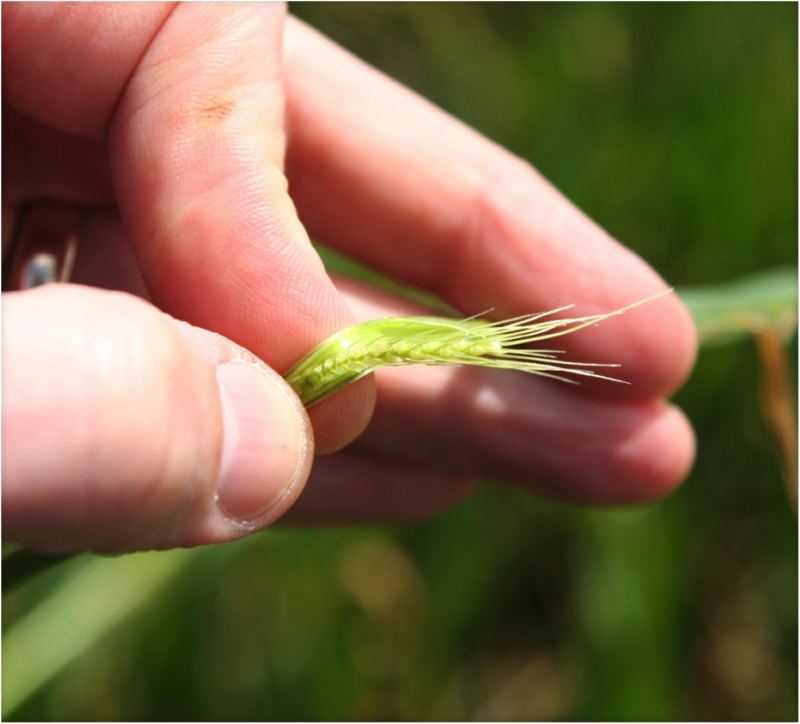 Most wheat varieties are now at first hollow stem. As mentioned in previous posts, the drought has wheat development in Oklahoma a good one to two weeks behind normal. If you still have cattle on wheat pasture it is past time to remove them, as there will be a significant grain yield penalty for further grazing. We are not progressing towards first hollow stem as quickly as I anticipated, but most varieties are getting close. The drought has likely slowed onset of first hollow stem. Keep in mind that drought stressed wheat might need longer to recover from grazing, so it will likely be better to remove cattle a little early in 2013. The OSU Small Grains Extension team checked first hollow stem at Chickasha and Stillwater this week. Measurements from both locations are provided in the tables below. Varieties with 1.5 cm or more of hollow stem are considered to be at first hollow stem. Numbers have not changed much at Chickasha due to the cold weather; however, with temperatures climbing into the 60’s next week we should see rapid progression of first hollow stem. Although planted a few days earlier, Stillwater is about a week behind Chickasha in terms of first hollow stem. This is due to severe drought stress at Stillwater. In fact, there were a few times I questioned wether or not the Stillwater plots would survive. In this situation it is important to not only consider first hollow stem but also the amount of green leaf area remaining after grazing. Wheat with less than 60% ground cover at jointing will likely not achieve full grain yield potential, even if cattle were removed prior to first hollow stem.